They had just arrived in a foreign country and the small girl’s mother was sent away. Ernest and Mimi Hausner fled their home in Vienna in 1938, when little Evelyn was just a toddler. Nazi Germany had annexed Austria, putting the lives of Jews like the Hausners at risk. They made it to England as refugees, but when war broke out the next year and tensions were heightened, Mimi was feared to be a spy and sent to an internment camp on the Isle of Man, far away from her daughter. Evelyn’s father put her in care while he worked to raise money and get his wife out of the camp. By 1940, the family was reunited and they immigrated to the United States. The experience made her tough, Evelyn H. Lauder later explained. Her strength enabled her to help lead a global cosmetics company, Estée Lauder, after she married into the Lauder family. She used the platform the business afforded her to launch a philanthropic campaign that has a worldwide reach, both in terms of who it helps and who contributes to its work. After Lauder was diagnosed with breast cancer in 1989, she became an advocate for women’s health. In 1992 she and Alexandra Penney, editor of Self magazine, launched a pink ribbon campaign to bring attention to breast cancer. Lauder and Penney drew inspiration from the red ribbon campaign to raise awareness of AIDS. They recognized that the red ribbon was bringing great attention to the problem of AIDS and hoped to bring similar attention to breast cancer. 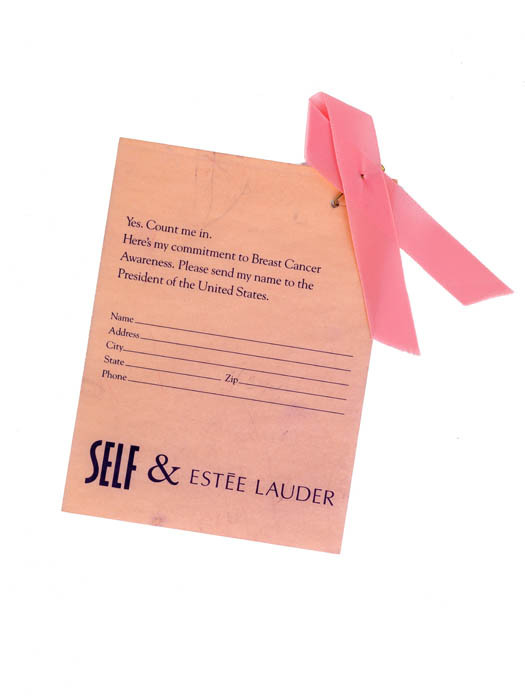 By placing pledge cards and petitions at makeup counters and branding certain Estée Lauder products with pink ribbon designs, Lauder and her colleagues tapped into women’s purchasing power to raise funds for the Breast Cancer Research Foundation. 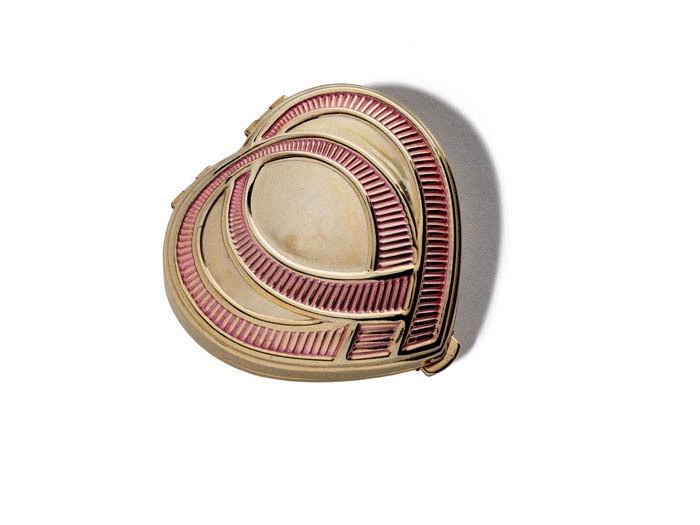 A makeup compact with pink ribbon branding, sold during Estée Lauder’s early campaigns. Lauder’s work against breast cancer continued. Together with cancer researcher Dr. Larry Norton of Memorial Sloan Kettering Cancer Center in New York, and with her husband, Leonard, Evelyn Lauder created the Breast Cancer Research Foundation in 1993. The idea was hatched around Lauder’s kitchen table and it built on her experience as a businesswoman and arts philanthropist. Norton had explained that researchers were gaining an understanding of the molecular science of cancer, but that there needed to be greater communication between scientists and clinical researchers to bring together advances in the molecular understanding of cancer with knowledge of effective ways of preparing drugs and testing them clinically. Existing funding practices made that communication hard. Lauder responded that she had always been around creative people in the cosmetics industry and as an arts funder. As a result, she knew that they needed two things: freedom and security. She understood the ability to create—including in cutting-edge scientific research—rested on scope for imagination along with the financial security to fail constructively and learn from the experience. The Breast Cancer Research Foundation was born to give cancer researchers those opportunities. 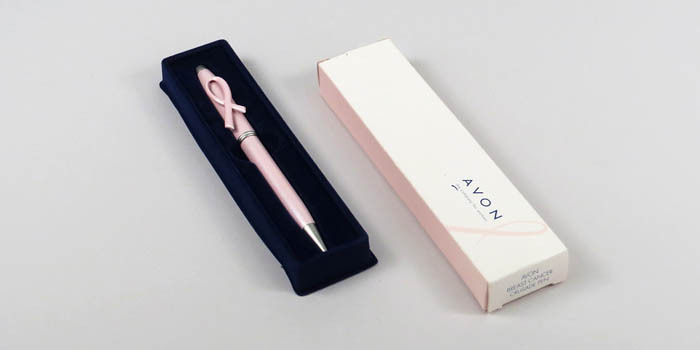 AVON offered this pink pen to donors who supported breast cancer research through its foundation. The Breast Cancer Research Foundation joined several other foundations working to prevent and cure breast cancer. Avon’s Breast Cancer Crusade was also founded in the early 1990s, and the Susan G. Komen Breast Cancer Foundation was founded in 1982. These are just a few of the organizations working to prevent and cure breast cancer today. 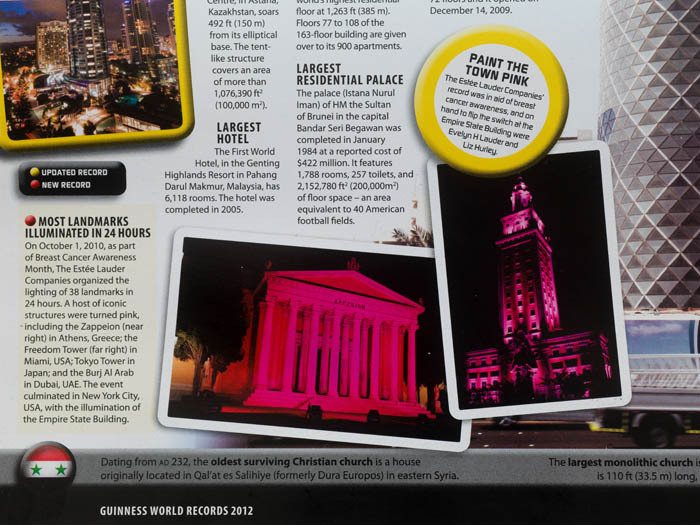 In 2012 the Guinness Book of World Records honored the Estée Lauder Companies’s initiative to illuminate landmarks pink to raise awareness of breast cancer. In some ways extraordinary, Lauder’s story is also typical of many in medical philanthropy throughout American history. Her character was formed by crossing borders. Her business was international. She drew on her own and others’ experiences in various philanthropic causes to craft a new endeavor. She and her colleagues created an organization that funds researchers in countries across the world. Breast cancer is a leading cause of death for women in developing countries around the globe—as it is in the United States—and the organization Lauder created has a mission that extends far and wide. People, knowledge, diseases: the story of American medical philanthropy, like Evelyn Lauder’s story, reaches far beyond the country’s borders. Amanda B. Moniz is the David M. Rubenstein Curator of Philanthropy in the Division of Work and Industry. The Philanthropy Initiative is made possible by the Bill & Melinda Gates Foundation and David M. Rubenstein, with additional support by the Fidelity Charitable Trustees’ Initiative, a grantmaking program of Fidelity Charitable.